John Stephen BUCHSER, was the son of Stephen G and Mary F BUCHSER. He was born on June 14, 1924. 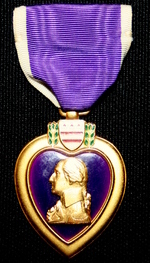 He was enlisted on April 10, 1943 at Pittsburgh, Pennsylvania and entered on service on April 17, 1943. He received ASN 33677976. He was probably immediately send at Camp MacKall and assigned to Battery C of the 155th AA Bn / 17th AB. John BUCHSER was killed in action on January 07, 1945 during the Battle of Dead Man's Ridge. He had 20 years-old. His body returned stateside in 1949 and he is now permanently buried at Calvary Cemetery at Pittsburgh, Allegheny County, Pennsylvani. Francis J CALPIN after the VE Day then he served with the 101st AB Division in Germany (photo from Richard P Pohanish). Francis J CALPIN was born in 1925 in Scranton, Pennsylvania where he grow up until his induction in the Army on April 8, 1943 at Wilkes Barre, PA. 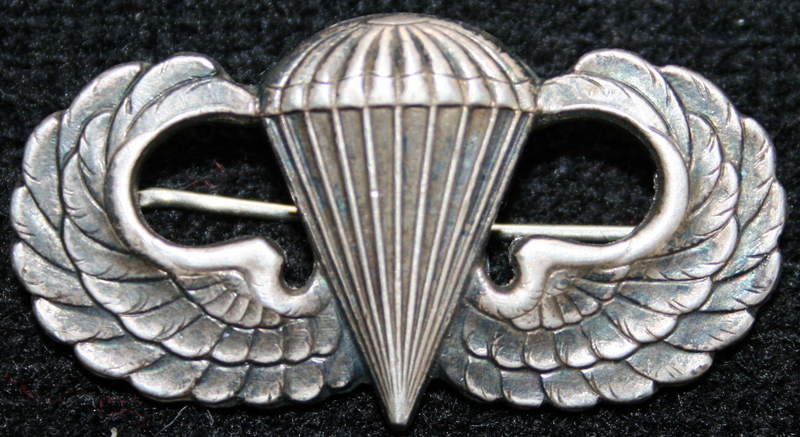 He received ASN 33603132 and was immediately assigned to the new 17th Airborne Division at Camp MacKall, North Carolina. He joined the Battery E of the 155th Airborne Anti-Aircraft Battalion (under command of Lieutenant-Colonel John W Paddock). Batteries D, E and F were especially dedicated to anti-aircraft missions while batteries A, B and C were affected to the anti-tank defence. As a « first hour » 17th Airborne trooper, Francis J CALPIN followed the division from Camp MacKall to England. 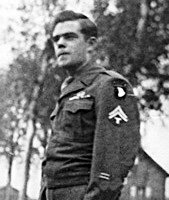 Members of the 155th AAA Bn were Glider troops but like the other Glidermen of the 17th AB Division, Francis was qualified paratroopers while he was at Camp Forrest, TN in summer 1944. When the division enterred in combat in the Belgium Ardennes on early January 1945, Battery E was assigned to the defense of the 193th GIR on January 9. Later, Battery E was assigned to the support of the 513th PIR. After the Bulge, the 17th AB Division was send in Châlons-sur-Marne, France for rest and preparation of operation Varsity. On March 24, Francis took off from Bretigny, France (airfield A-48). Battery E was carried in 12 gliders (n°70 to 81) from serial A-12 and A-13 as part of the 194th Combat Team who had received the mission to seize and hold crossings over Issel river. Only one glider was lost during the travel when glider n°81 was obliged to landed (safely) in Holland. 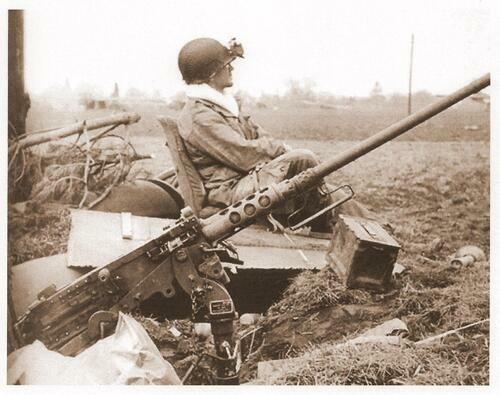 He landed on Landing Zone S.
The mission of Francis and his buddies was to give .50 caliber machine gun fire support on any missions given them by the 194th GIR. By 16h00, Battery E had assembled joined its unit and was in position. Man of Battery E - 155th AB AA Bn on March 24, 1945 during the first hours of operation Varsity (National Archives). On the night of D-day, the men of Battery E successfully repelled a German counterattack and inflicted heavy casualties to the enemy. After D-day, the 17th AB advanced toward Munster and after that took part of the battle of the Ruhr pocket in April 1945. 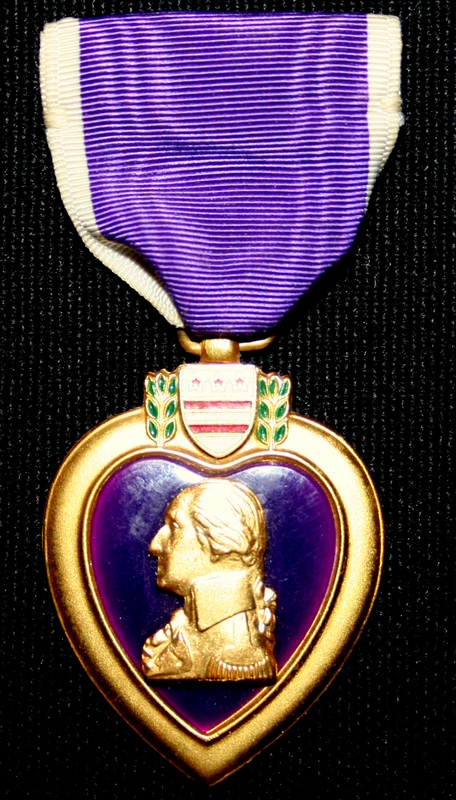 It is during this battle that Francis was wounded by piece of schrapnel through the shoulder (and exiting the neck). 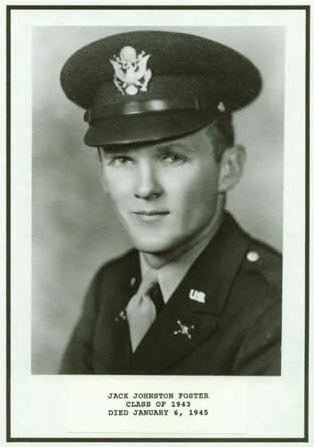 When he was discharged from the hospital in June or July, he found himself re assigned to the 101st AB Division and was training for the invasion of Japan. This tribute has been realized with the help of Richard P Pohanish, son of Francis J Calpin. Jack J FOSTER, was born on July 08, 1921. He was enlisted on May 03, 1943 at Fort Jackson Columbia, SC and received ASN 34654744. He than attended the Officer Candidate School and was graduate 2nd Lt (ASN O-534203), Class of 1943, of the Citadel of South Carolina. 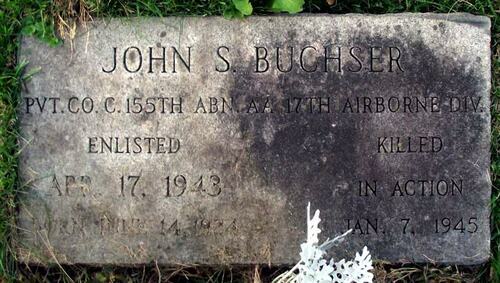 He was assigned to the 155th AA Bn / 17th AB. 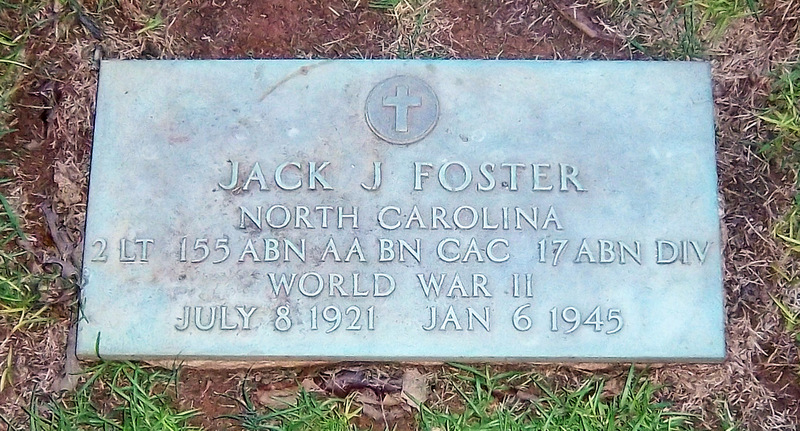 Jack J FOSTER was killed in action on January 06, 1945 during the Battle of Dead Man's Ridge. He had 23 years-old. His body returned stateside in 1949 and he is now permanently burried at Montlawn Memorial Park in Raleigh, NC. Ivin C JOHNSON was born on 1917 in Galveston County, Texas. 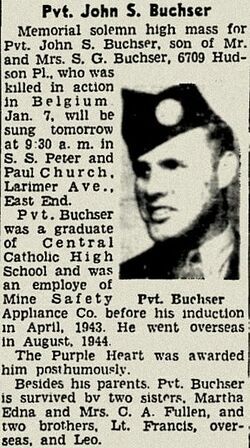 After being inducted in the Army, he received ASN 38541259 and was assigned to the 155th A/B Anti-Aircraft Bn. He died of wound on January 10, 1945.